Announcement should soon be forthcoming about the acquisition of noted Pinot Noir producer Panther Creek Cellars of McMinnville by Bacchus Capital Management of San Francisco and New York. The investment firm has steadily built a presence in the wine industry over the last five years, buying or taking a substantial ownership position in seven winery and wine-related companies, principally in California. Its first Oregon move was in September 2011, when Bacchus invested in Wine by Joe of Dundee, the multifaceted winery owned by longtime winemaker Joe Dobbes. Panther Creek was founded in 1986 by Ken Wright. It rapidly rose to prominence for its stylish Pinot Noirs that helped enhance Oregon’s reputation for the fine but finicky Burgundian variety. Wright sold to Ron and Linda Kaplan in 1994 and opened Ken Wright Cellars in Carlton. The Kaplans subsequently sold to current owner Liz Chambers of Silvan Ridge in Eugene. Mark Eggiman of Panther Creek Cellars revealed that Bacchus Capital obtained outright ownership of the winery on March 1, 2013. “I am now reporting to Anthony Van Nice at Dobbes,” he said. 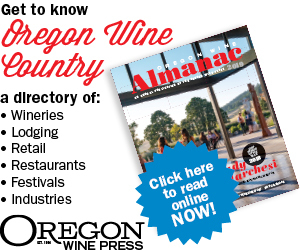 As Eggiman understands it, plans are to switch production of Panther Creek wines to the Dobbes facility in Dundee and retain the McMinnville winery for custom crush and private label production. Michael Stevenson will remain as winemaker at Panther Creek and continue to produce his own Stevenson-Barrie wines there, as well as overseeing custom contract production. The winery’s tasting room is currently closed but will reopen for regular business hours, daily noon to 5 p.m., as soon as issuance of federal licensing has been completed.